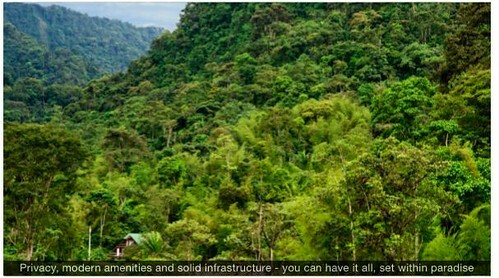 Here is a special Mindo cloud forest real estate opportunity. Mindo is one of the most bird-diverse places in the world and was declared the first “Important Area for Birds” (IBA) by Birdlife International, an NGO formed for the conservation of birds and their habitats because it harbours an estimated 500 species (more than all of Europe), including some 36 endemic species. The global economy is entering into phase II of the biggest economic shift in the history of mankind. This evolution in trade and productivity will hugely benefit real estate in Ecuador as well as the US. If you want to see why I have been buying real estate in Ecuador and the USA, see part II in a series below. Ecuador is well known for the high Andes and wonderful beaches… but there is a growing awareness of Ecuador’s cloud forests as a great place to live and invest. 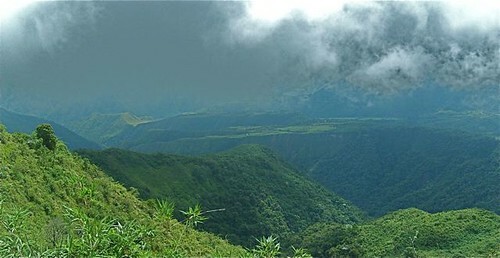 The benefit of the cloud forest is a lower altitude and warmer temperatures plus a lush tropical foliage. 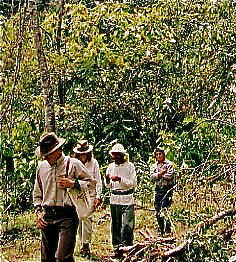 This is where Merri and I first purchased land in Ecuador and where we are now focusing much of our attention. Our Hacienda Rosaspamba is 962 exquisite acres of Ecuador cloud forest near Mindo. Our home is really remote…down that trail to this point. This land is smoky with clouds… a primary forest shrouded in mystery… energy… life and nature’s beautiful way. We have cloud forests, a bold trout river, a primary forest and beautiful views. This is our valley and here I am with Merri hiking our land with an Ecuadorian shaman and his apprentice. We love this land because we can grow everything… from blackberries to grapefruit! However not everyone wants remote… nor does everyone want 962 acres. This is why we have been watching and writing about the Arboretto gated community in the Mindo Cloud Forest as the project has evolved. offers great access to the city when desired…but oh, that weather is so beautiful and the altitude so good. 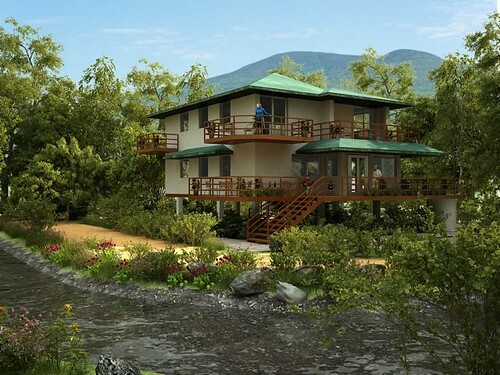 This is why I am happy to send this advertisement and a special offer for the next phase of the cloud forest gated community from Swen Lorenz who writes:. The insider story set in one of Ecuador’s “secret” tourism locations, on the brink of being discovered. Become the neighbor (quite literally) of an international investment expert who bets his own money that Ecuador will be the next investment red hot destination …. … and get in at a $3,500 discount (first come first served). – Managed by a developer who has a proven track record for quality. – The homes are approved by a US construction expert with 25 years of hands-on experience, and are built to international standards. 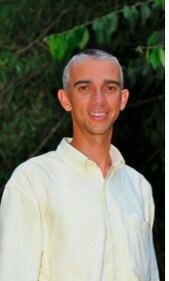 My name is Swen Lorenz, I am an international investor and author of two investment books. I have been writing about international investing since 2004, with published articles in more than 40 publications in 7 countries. Some of you might have come across my investment blog, www.undervalued-shares.com. On the surface of it you would probably expect me to live in New York, London, or Hong Kong – or some other major financial capital where banks, hedge funds and investment firms keep their headquarters. Indeed, I have lived in two of these major capitals and set up a successful fund management company in the third one. Besides that, I have spent my life traveling extensively and have been lucky enough to tick many of the world’s best-known tourist destinations off my list. The Ginza district of Tokyo, the Victoria Falls in Zambia and the amazing landscapes of Patagonia – been there, done that. Yet, despite all the glitzy destinations that I have often frequented, I’ve lost my heart to a small country in Latin America. Ecuador. It’s a place that most people would have a hard time finding on a map. Certainly, this isn’t the country that your average investor would look at. Too remote, too small, and not enough available information. And how would one possibly find local people that you know you can trust to do a good job for you? These perceptions are going to change over the coming years, driven by developments such as the new international airport in Quito, the unstoppable growth of eco tourism, and the growing affluence among Ecuador’s 12 million people. Ecuador is gradually becoming a credible and attractive place to do business in. As a matter of fact, a friend of a friend has just now started to build a new $10m hotel in Ecuador. He is so confident about Ecuador’s prospects that he is literally betting the farm on it. The difference between how the country is still perceived by most and what I experience on the ground, couldn’t be any bigger. E.g., the outside world still believes that Ecuador is a risky country to even set foot in (let alone invest in!). Yes, there is the occasional wobbly moment, such as the recent police riot when President Correa dared to cut the pay of over-paid public servants. Yet, these instances are simply a part of a country maturing and the foreign press makes it look like a much bigger deal than it really is – the whole thing was over within a day. I have more than 15 years of experience of investing into emerging markets, and Ecuador is a safer bet than most countries that are peddled by the mainstream investment media. Gary also recently wrote an interesting piece why now is the time to buy in Ecuador. There are many factors that make Ecuador an interesting investment location to investigate. I have invested quite heavily into the country already, but unusually, I’ve also made this particular investment area my home. You are probably wondering how this all came about? What took me to Ecuador? A few years ago, I came here on holiday. And instead of lazing away on the beach, I ended up starting a school project over here. We entrepreneurs just never stop thinking! Initially, because of the school project, I came back over and over again. Every time I came back, I grew to love it more. Now I am essentially ready to not even leave anymore. I have so many friends over here, that the country truly feels like home (and that’s despite me still not being properly fluent in Spanish because it’s so easy to get through with “Spanglish”). Having traveled the globe, I’ve found Ecuador to be one of the world’s best places to settle in. The people are amazing and quite different from other countries in Latin America (they are the friendliest I have encountered in any country). Prices for day-to-day living are low. That’s on top of the fact that real estate offers great value. And it took me just 21 minutes to get the application for my residency papers done – so Ecuador makes for an easy transition, too. The strange thing is that few people would have even heard of Ecuador – unlike Costa Rica, Belize or Croatia – countries that were also once considered too remote and too ‘exotic’ (or risky). However property prices in these places soon spiraled upwards because of American and European investors moving in. It’s for that very reason that you can still invest in Ecuador right now for a price that is just so much more attractive than investing elsewhere. So if you have ever wondered if it’s worth owning a piece of land in Ecuador, then keep reading. Here you’ll get the insider’s view of someone who has actually done it, using his own money, and who is savoring living the life of an expat in Ecuador. Welcome to my life. It’s a fact that Ecuador is one of the world’s most biologically diverse countries. Personally, it makes little difference to me whether a country has 100 or 1,000 different species of butterflies, birds or orchids. There is a point where you can have biodiversity coming out of your ears. – Clean fresh air, with lots of birds, wildlife, and green spaces all around. – High standard of local and international cuisine and tasty, nutritious and diverse fruits and vegetables galore. A feast to the eye and palate, and eating healthily extends your life, too. – Owning a bit of land that makes you feel you have a small bit of paradise to yourself, and to do so at a price that by American or European standards is cheap. – The opportunity to learn a new language by simply going about everyday life and picking it up (and one day I definitely WILL be fluent!). – The chance to make friends from all over the world. – Extremely cheap labor, e.g. having a maid/gardener for $300 a month. – The option to build a house just how you like it, i.e. lots of useful features that blend in with the environment, but without bureaucrats telling how you have to do it. – Making an investment that is so attractively priced to begin with, that its value can literally only go up. – And the list goes on and on and on…. You know about Ecuador already, and you are looking for a specific opportunity to make an investment and (potentially) create a new life for yourself. And this is usually, where the difficulty starts. I don’t even want to imagine how many foreigners (Americans, Europeans, Australians, etc) have come to Ecuador (and other places), put down money for a piece of land or even a house – and ended up utterly disappointed, with their dreams in shatters and their money partially or completely lost. It must not be forgotten that Ecuador is also a developing country, a place where you need to know your way around or else you’ll end up in the hands of shady operators. I know, because I have seen it happening. As a matter of fact, in some way I have even been affected by it myself. Not because someone did a runner with my money. But the developers that I hired to build my own house ended up running into liquidity problems when the banking crisis hit. I set up my first business when I was 15 and have never been employed in my entire life, which is why I know that too much success can also kill a company. Over-expansion at too early a stage is a killer for thousands of young ventures every year. Stretch yourself too thin, and as soon as some unexpected external event happens, you end up finding yourself in hot water financially. – Delivered the architectural plans on time and just as I had wanted them (I only had to do very minor tweaks). – Finished construction on time and 10% below the budgeted costs (I got money back at the end – unheard of!). – Created a house for me that during the first one and a half years of using it, has had only very minor problems that all got fixed as soon as I pointed them out. And still, I had to watch this developer run into deep financial problems. These were the people that I had wanted to hire for my future real estate investments in Ecuador, and instead they faced going bust. Luckily, in every problem also lies an opportunity. 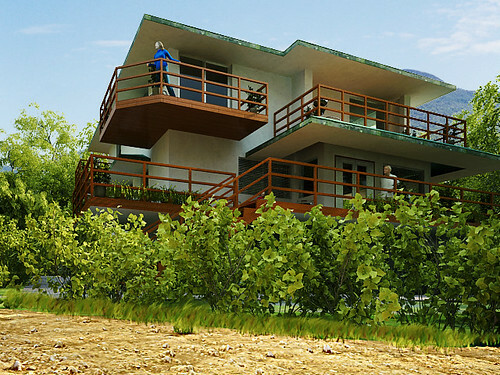 Instead of hiring the developer for future projects, I simply bought out one of the partners, injected the necessary cash myself, and instigated a restructuring aimed at putting the company back on the road – with a view to eventually making it bigger and better than ever before, and with the ambition to turn it into the best eco home developer in all of Ecuador. It’s because of me having stepped in to save this high quality, but cash-strapped developer from the brink, that I can today offer you an extraordinary opportunity. It’s one that I guarantee will not be repeated once the first 5 investors have signed up. Read on if you want to find out how to be one of those 5 insider early birds. There are a couple of fundamental truths that I believe in when it comes to investing. One is, that pristine nature will only ever get scarcer on this planet (therefore prices can only go up). Secondly, tourism is the world’s largest industry and it will only keep growing. Make sure that your property investments benefit from tourism! And tying in with my first point, ideally invest into property that benefits from eco tourism. The World Tourism Organization estimates that ‘nature tourism’ is growing at 10-30 per cent growth per year. That’s much faster than any other part of the global tourism industry. – Joy of ownership (it comes thrown in as a bonus). That’s why I took notice when I was first told some details about this particular area. It was an eye opener. Here was a place that was just destined to take off as a tourism destination. On top of that, this particular development is set within a national park! Once you look at it in detail, the Mindo opportunity immediately makes sense. This is a project that will appeal to a large audience, not just to the bird watchers who were the original pioneering tourists in this area. – The right mix of being remote enough to be a real get-away-from-it-all, while still being easy to access. From Quito it is only a 50-mile drive on a high quality road, with restaurants and shops along the way. Map of Mindo and its surrounding areas. – Set within the Mindo-Nambillo Forest Reserve, a visually stunning protected area that has been featured on the Discovery Channel. – A fast growing local tourism sector. To speak of this place growing by leaps and bounds is no pipe dream, it’s already happening. That includes both Ecuadorian tourists and international visitors. – The number of activities available to you locally is increasing rapidly. 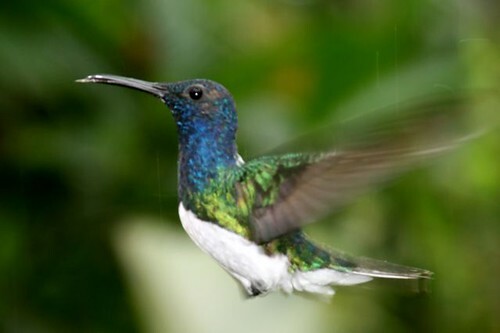 Bird watching is what Mindo first became famous for, but it’s now becoming an eco and adventure holiday haven, with clean rivers to swim in, fresh food in restaurants where you can watch hummingbirds from your table, trails for hiking and trekking, rivers for tubing, and countryside lanes for biking. You can go horseback riding, treat yourself to some time in a Spa, visit butterfly farms, enjoy fresh trout in hosterias or go for walks to study flora such as orchids. You can also volunteer and participate in the local community; for example, one of the residents of Arboretto teaches English in the local school. Families, retirees, adventurers, writers looking for a quiet place, and anyone looking for a better lifestyle – Mindo suits many needs. 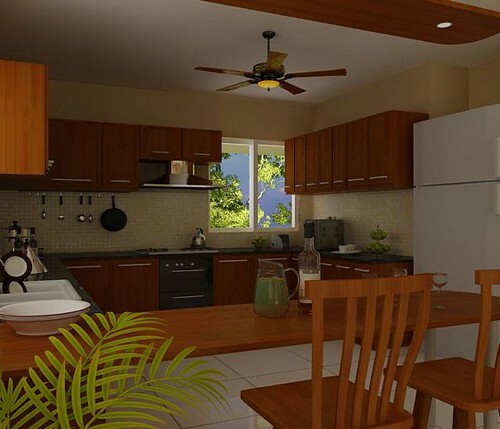 – It’s a tucked away location that offers the opportunity to own a piece of land and build a house in a place that is quite simply a little bit like paradise on earth. Mindo is one of the leading bird areas in the world. Can you already picture yourself here? This is a valley that has its own small stream running through it. To the back, there is the nature reserve (= off limits for development) of an award winning eco lodge. To the side, there is 5 km (3.5 miles) stream, the San Antonio River, which is born from the junction of several underground sources within the nature reserve (no industrial farming or agriculture to pollute its waters). It’s a 15-minute drive from the town of Mindo, the small but growing hub for tourism in the Mindo area. – You don’t have to fear nasty stuff like malaria. It doesn’t exist in this area because of Mindo’s altitude, which does not allow Malaria-transmitting mosquitoes to thrive. – There are local doctors, and for anything more serious you can easily get to first world medical services in Quito (at third world prices). – Mindo offers you the chance to be creative when it comes to living your life, e.g. you could volunteer at a local school, start a workout program to get really fit, or simply pursue your hobbies while not spending more than $5 on a lunch in a local restaurant (and for $20 you can eat in a top class hotel restaurant). – Maintenance of land (for those who like to own it as an investment and a potential retreat for later). – The construction of houses (for those who want to strike while the iron’s hot). – The local management of the entire project (to make sure everything remains in order for the community of owners). When I first visited, this project was already well beyond the mere planning stage. With a road there, the construction of the first model house well underway, and meticulous planning for the all the various details drawn up, it seemed like nothing could potentially stop this project. Nothing, except for the collapse of Lehman Brothers and the biggest banking and credit crisis of living memory! That’s the one thing that no one had seen coming. In early 2009, the too fast expansion caught up with this particular property developer. Work in the project slowed down, and the company needed a restructuring of its funding sources. And that’s exactly the kind of work that I like to do. Fund raising, structuring corporate transactions and helping with turnarounds is just my area of expertise for the last decade. E.g., back in 2008, I helped restructure a failed consumer goods company in a developing country that had also expanded too fast and ran into liquidity problems. Under my stewardship, the company reduced staff by more than 50% and cut away a lot of slack. Today, the operation is not only 4 times bigger than it was before it got into trouble, but is now on a firm footing too. This project in Mindo simply deserved to get a fresh start, which is why I decided to step in. I simply bought into the company so as to help make things happen. ADVENTO S.A. is the property developer behind the Mindo project. Compared to other restructuring cases that I have been involved with, ADVENTO was actually a fairly simple case. All the papers and accounts were in pristine condition. The plans for the projects were top notch. And the day-to-day management team is led by the best manager that I could possibly imagine for a company like this (more about him later). The primary issue was a lack of liquidity during the banking crisis. Demand from investors had dried up just as much as the availability of funding had also became extremely restricted. This required putting fresh capital into the company and paying off some loans and debts. – The company does not owe any money to suppliers, clients or other outsiders. A lot of financially instable fly-by-night real estate operators faltered during the crisis. We are a solid partner, full stop. – I have reviewed all the plans and projects, and what little tweaking there had to be done to get the projects up to scratch, has been done. – We have an experienced, US based construction expert on board who advises ADVENTO using his decades worth of insights into construction. With all this being in order, I am now more than happy to stick my neck out and personally throw my weight and name behind the Mindo project. We have polished the “Mindo Arboretto” project (Arboretto comes from the word “Arboretum”, or a botanical garden). We have thought of every single angle that there is to think of. We can now offer a choice of 6 different villa models, on a choice of three types of lot. – Riverside view (set beside the San Antonio river). 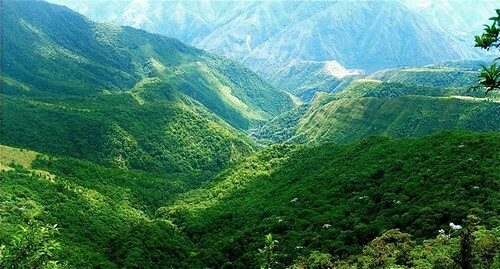 – Canopy view (set high up in the valley so as to benefit from a view). – Base lots set lower in the valley offer a great budget conscious choice and all that set in pristine nature. There is not a single lot that isn’t desirable, they are simply different in what they offer and those who come in early have all the choice in the world. house that leaves absolutely nothing to be desired as this computer generated rendering shows. – Bromelia (Bromeliad) and Quinde (Tree Frog) are single story options. – Helecho (Fern), Orquidea (Orchid), Colibri (Hummingbird) and Mariposa (Butterfly) have 2 storeys. 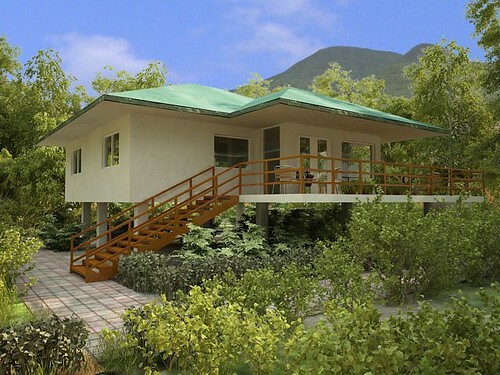 The lowest-price option is $97,576 for a 2 bedroom / 1 bathroom villa including a base lot. For quality construction set within such a professionally developed project, you’ll be hard pressed to find a comparable offer. If you want to look at the other end of the scale, for a price of $222,311 you get the 4 bedroom / 3 bathroom Mariposa villa including a plum riverside lot. 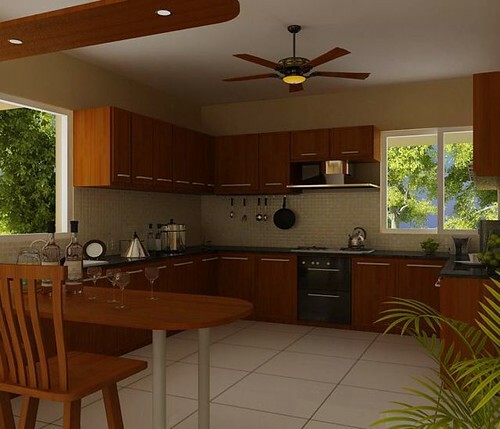 well as shown in these computer generated renderings. Additionally, all of the houses can be tweaked and customized so as to accommodate individual preferences. 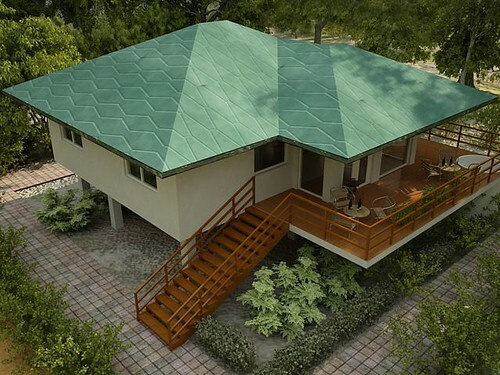 On a like-for-like basis, you will be hard pressed to find such quality construction at this price in Ecuador. 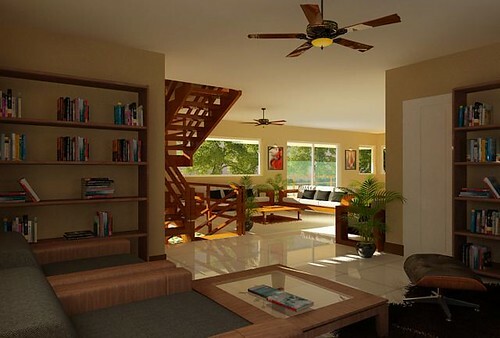 These prices will be adjusted upwards, as the project consolidates with further building. We invite you to come to the project to see and experience for yourself. 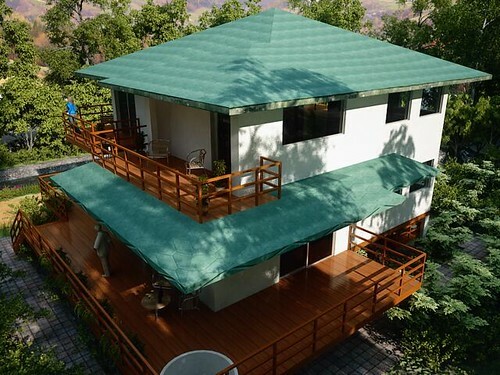 There even is an initial, fully furnished home that has been finished already and which anyone who wants to get a feeling for spending time in Mindo can have a closer look at. 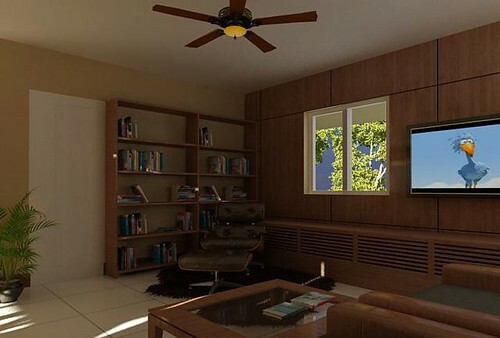 The other house-types offered will be quite distinct from this model house, so you truly are spoilt for choice – and you can get a first-hand impression of the quality of materials and craftsmanship by visiting the project’s model house. Needless to say, we have virtually everything in place already to make this work for you. I believe in efficiency, and we have already done 99% of the planning that is necessary for a seamless project. 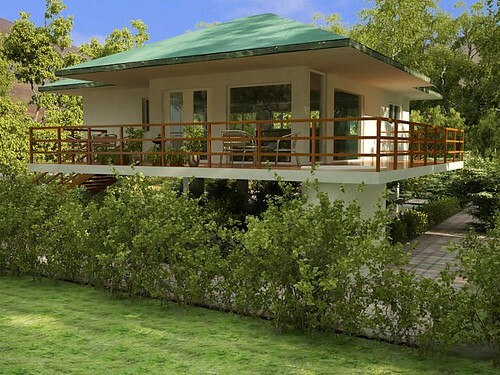 Provided of course, this kind of “haven set within pristine nature” is what you are looking for. All the lots come with a set of covenants that are registered to the land, and that only allow for development that is in tune with the surroundings. This in turn protects those who buy into the project for its stunning features. And to be frank, if you absolutely don’t like the overall concept of an eco community of internationally minded home-owners in a nature reserve, then please simply look else where. I am convinced of the overall concept as it stands now, and I don’t want to see brash condo buildings in an area where I believe small individual nature-respecting houses are the way forward. There is already a clear vision in place, and it’s one that I believe will appeal to a discerning audience. Obviously, if you like inner city apartments, then Mindo Arboretto is not for you. If you don’t like Spanish-speaking countries, it’s not for you either. And if you believe that a rural community in Ecuador has to have a McDonald’s, then please for heaven’s sake stay where you are! We prefer home-made Patacones to food from chain restaurants owned by anonymous corporations. Everyone else who has so far found this interesting, keep reading! Since I am putting my (carefully built) reputation on the line, I want this project to become a success for its owners and investors. For me, Mindo is the best opportunity to propel ADVENTO (the development company) into the next league. If Mindo Arboretto goes well, ADVENTO will have the gates wide open to expand into other areas in Ecuador and become a premier provider of real estate services to a demanding foreign clientele. For you, this means that you will benefit from being part of a standard-setting development. I’d even like to underline just how much this is thought out to be a project for a clientele that is asking for quality. A rare commodity in Ecuador. You can easily find a dozen other projects in Ecuador that will look like a bargain on the surface. Someone might offer you that beachfront lot for $5,000 (and a three-course lunch with French wine for $1.50), and others will promise you a full set of infrastructure for a bargain price that sounds too good to be true. But remember, if it sounds too good to be true, then it usually is (and there is a long list of failed projects in Ecuador and elsewhere in Latin and Central America). Again, I can back these claims up with more than just words and promises. There is a tangible track record. ADVENTO has been hired by a large investor into Ecuadorian property – to help them sort out the mess that their inexperienced local partners had caused. This is because ADVENTO has the inside view of what can go wrong. When you’re working with a company that other developers come to, you can be confident that you’re in experienced hands. That’s why I can ensure that you won’t have to deal with the problems that so often blight other projects in Latin America. How much will you save on maintenance costs if you don’t have the road washed away the first time you get a bit more rain than usual? Or how about tripping up on electrical cables that commonly run along the ground? That international standard of work and materials in Arboretto Mindo, ultimately increases the value of your investment and it maximizes your rental potential. In the end, spending some money on quality right at the beginning is cheaper (and a better investment) than having to deal with problems later on. High quality infrastructure development – ranging from functioning water supply to a reliable electric grid and finishing off with communal facilities such as a pool – simply come at a certain price. ADVENTO has experience in sourcing the best value solution available on the Ecuadorian market, balancing quality and durability with price. The company researches thoroughly and negotiates tough with suppliers. But still, a quality project done with careful planning and designed to deliver what it promises, can’t be done for the price that sometimes you might see advertised elsewhere. I don’t want to mention names, but just looking at some of these offers I can tell you straight away that who ever falls for them, will end up disappointed and feeling defrauded. Again, I have experience with this as I am myself living in a house that ADVENTO built. The house was more expensive than what I would have paid in other developments. In the meantime, I have learned just how much it increases your quality of life if you don’t have to deal with all sorts of constant problems that we in the U.S and Europe just don’t expect, but are the norm in Ecuador. In the end, spending some money on quality right at the beginning is cheaper (and a better investment) than having to deal with problems later on. Take the first pick of the available base lots in Mindo Arboretto, and purchase one for $24,500 (instead of the $27,000 that they will cost after the initial launch). This price will include the costs for the deeding process. It will take approximately six weeks to get your deed delivered (in the meantime, your funds will stay in a lawyer’s escrow account). Getting the deeding done is an extra $1,000 in value. You can choose any one of the available base lots and you get $2,500 off. And not forgetting our no risk, 100% refund offer if you are not delighted with your purchase. You have until 15th Feb 2011 to visit Arboretto-Mindo after your purchase, and if you decide it is not for you, you will receive a no-quibble refund within 2 weeks. This offer is first come first served. – Photo Brochure about the Mindo Arboretto Project, including renderings of house types. – Quick overview of the process how to buy and sell these lots, and information about the future management of the project’s communal parts. – An English translation of the real estate registry deed that you are going to receive. – An English translation of the covenants that are attached to each lot so as to make sure all lots will stay in line with the project’s overall spirit, e.g. restrictions on not being able to build more than 2 storys. – Mindo Arboretto project website, www.arboretto-mindo.com (This website gives full details of all the lot types and villa models). You can see how we have put a lot of effort into getting this right – not the least as I want to demonstrate that investing in Latin America does not necessarily mean having to deal with delays and problems. In other words, he is a guy who is used to managing such tasks – and besides that, he is also an extremely friendly chap that I am sure you will enjoy working with. Besides, he speaks perfect English (and if you like, you can converse in French with him as he grew up in Geneva as the son of a diplomat). If you have any questions left, you can simply email me (swen.lorenz@undervalued-shares.com) or our general manager in Quito (carlos.tobar@advento-sa.com). Both of us will be happy to share our entire knowledge with you, not just about Mindo but also about all other aspects of living in Ecuador. Speaking of which, you might be interested to hear that a good part of the infrastructure for the project is actually already in place. Most lots already have road access. The road has been built in such a way that it is protected against the run-off of rain, and the bit of the road that leads along the stream is specially protected against a river swell. As you can see, this project isn’t the kind of pipe dream that other developers are peddling. It’s already happening, and it’s all been carefully planned so that there are no nasty surprises with maintenance at a later stage. Of course, there are some problems that we cannot solve. The bumps in the public road leading to the project. The fact that when going to Quito, you currently still have to go through the old airport. And personally, I find it terribly annoying that the news stands in Quito aren’t capable of providing a crisp copy of the Financial Times every morning. But that’s all part of the deal. If it wasn’t like this, Ecuador would already be priced like Costa Rica or Croatia. And actually, for most of these small problems I can already see the solution on the horizon. The new airport in Quito is now on schedule for a November 2011 opening. The Financial Times is luckily enough available as a pdf version for download. And some day, the Municipality of Mindo will have the funds to upgrade the local road system – something that will in turn help them increase their tourism revenue. By that time, land prices are likely to have risen further. That’s why I believe now is as good a time as has ever been, to gain a foothold in Ecuador. And to do so in one of the natural reserve treasures of the country, where tourism is bound to continue to grow by leaps and bounds. In a way, you will even contribute yourself to keeping this area pristine. Part of the project is a 95 acres private reserve that will stay protected for eternity, and which you as a lot owner will always have on your doorstep. All this comes together to form a package that I believe, provides for a perfect start into a better, healthier and happier life. There is no better time to embark on a journey to such a new life than now. All you need to do, is drop us an email to get the ball rolling. For everything else, you can count on us as your local support team. P.S. : Would you like to meet me personally to discuss this opportunity? I am regularly in Quito and Guayaquil, and can often be found passing through the US and several European capitals. Feel free to drop me a note and see if our paths cross! I have a hectic schedule but I making a real effort to turn Mindo into a community of interesting and diverse people, and I always strive to make time for a coffee or for lunch with like-minded investors. P.P.S. There is a time limit to reserve! The $3,500 discount is available to the first five buyers who send their deposit. This offer is first come first served. Deal not final until you come and see. You then have until February 15, 2011 to visit the project. Upon your visit by this date you can cancel the reservation for a full refund. See the Mindo property and learn more about life in the cloud forest at the NEW tours created by Jean Marie Butterlin. See how to attend this tour and 50 more free. The global economy is entering into phase II of the biggest economic shift in the history of mankind. This evolution in trade and productivity will hugely benefit real estate in Ecuador as well as the US. See part II in a series on why here.